The following design sample illustrates the steps that are used when the design professional determines lateral loads to the shearwall Fx, using proper code provisions, and then determines the resultant ASD level wall shear and overturning forces as distributed by the appropriate gravity and seismic code load combinations. These ASD loads are then provided to Simpson Strong-Tie in the form of cumulative tension (for rod design), incremental bearing (for take-up device and bearing-plate design) and cumulative compression (for when end-of-wall bearing post and stud design is requested). Simpson Strong-Tie will use this input to design the specific continuous Strong-Rod tiedown system as the tension restraint for the shearwall. During the design process of the overall structure, the Designer will have already determined the wall length, minimum wall height-to-width ratios, sheathing thickness and grade, nailing schedule, Δa for horizontal drift (or Designer to assume Δa = 0.2), floor-to-floor height (including floor depth to determine plate height) and all other requirements in accordance with the applicable building code. The Designer will calculate the cumulative overturning force at each level. These forces will be used to determine the end-of-wall incremental bearing, cumulative tension and cumulative compression. As these forces will initially be at strength level, the Designer must convert the loads to ASD and, for seismic, may use a 0.7 factor based on IBC load combinations. Tabulate the incremental bearing, cumulative tension and cumulative compression and provide these values in the Designer structural drawing set. See sample below. Compression post design can be performed by SST upon request. ASD end-of-wall values determined by Designer. 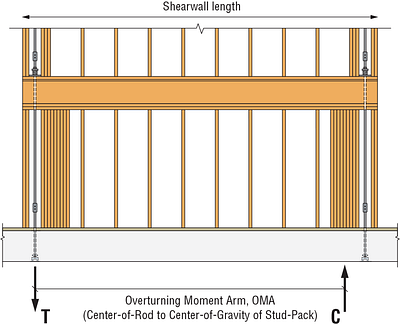 If compression post design is performed by SST, the end-of-wall forces to be verified by Designer if OMA is updated due to extent of post members. 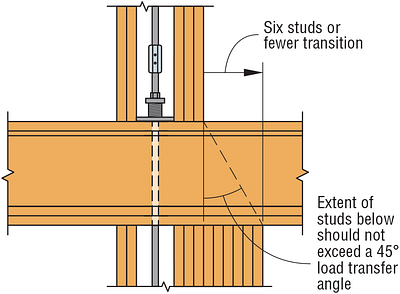 Determine the tension rod size, rod strength and rod elongation. The demand tension loads used for rod design are the ASD cumulative tension uplift loads. The appropriate couplers should then be selected based on rod strength and diameter. These will be used to connect threaded rods to one another as well as coupling to the anchor bolts within the rod tiedown system. See Figure 2. 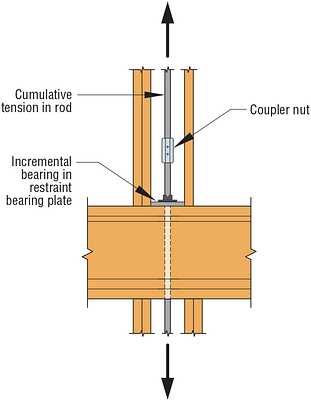 Note that Simpson Strong-Tie coupler nuts exceed the tensile capacity of the rod and are designed to follow the provisions of AC391. Next, determine the bearing-plate sizes and capacities. These plates are designed to transfer the ASD demand incremental bearing loads from the floor below via bearing from the top plate below, then through the blocking and the sole plate and into the rod via either a nut or an attached ratcheting device. See Figure 3. Wood bearing perpendicular to the grain of the wood sole plate, F'cperp = Fcperp x Abearing x Cb. The bearing area should consider the hole diameter in the steel plate as well as the drilled hole through the wood sole plate. Simpson Strong-Tie recommends maintaining the drilled hole such that it is no more than 1/4" greater in diameter than the steel rod. 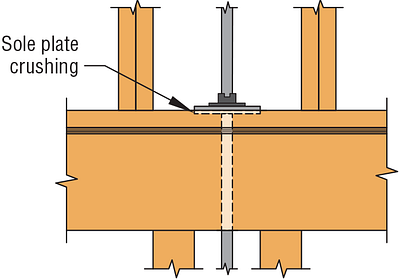 Steel-bearing-plate bending where the cantilever length can be taken from the face of the take-up device. Sole plate crushing/deformation (See Figure 4) should then be determined following the provisions of NDS Section 4.2.6. Though the standard equation of Fc⊥0.02 = 0.73 Fc⊥ can be used for initially evaluating the deformation, it should be noted that the effects of wood crushing are not linear and must be evaluated based on specific loading. Refer to the NDS for the variables and conditions. Note that the initial crushing value calculated using the NDS equations will be at ASD load level and can be used for purposes of evaluating AC316 limits. For story drift per ASCE 7, when this value is being used for wall deformation, a strength-level value would need to be computed. Next, determine the take-up device type and size. The NDS and IBC require that consideration be given to the wood shrinkage, where the total shrinkage in wood-framed buildings can be estimated by adding up cross-grain shrinkage of the wall plates, sills and floor joists, as well as the small fraction of shrinkage that comes from the studs and posts. This calculation is important for avoiding gaps in the system as the wood shrinks while the rod doesn't. See the Simpson Strong-Tie Wood Shrinkage Calculator for more information. Also, note that shrinkage is cumulative going up the building. In order to compensate for building shrinkage and to help meet the shearwall code drift requirements, take-up devices are necessary with most wood structures greater than two stories tall. Take-up devices are either ratcheting devices that have unlimited shrinkage capacity or expanding devices that have a designated shrinkage capacity. The ASD incremental bearing load shall be used to design the strength of the device. The other variables used for selecting the take-up device are the associated rod diameter, seating increment ΔR and deflection at the allowable load, ΔA, where ΔT = ΔR + ΔA (PD/PA). Finally, a system deflection check per ICC-ES AC316, Section 6.0, Item 9 will be conducted. This system deflection check is at ASD level, and it limits rod elongation and the shrinkage compensating device deflection to 0.20" at each level or between restraints unless the shearwall drift is determined to be within code limits. Note that while the sole plate crushing value is an option to be considered when required by the local building jurisdiction, this is not a requirement per AC316. 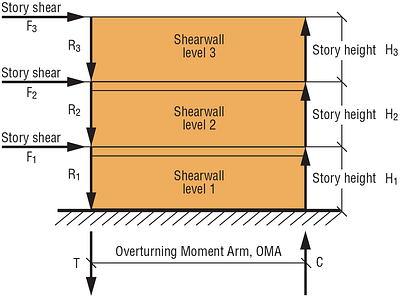 Determine the proper Overturning Moment Arm (OMA). In general, this length is measured from the center line of the tension rod at one end of the wall to the center of gravity of compression end at the other end of the wall. Refer to NDS Table 4A for the proper wood design variables as well as NDS Table 4.3.1 for the proper Fcperp' perpendicular-to-wood-grain design equation. The NDS will also provide the appropriate adjustment factors to use, including the column stability factor equation, Cp, as well as the FcE and Cp, Cf variables. Determine the NDS Parallel-to-Grain Capacity. Compute the ASD compression capacity of the end-of-wall wood members and determine the specific wood members to be called out for use in the design. See sample table below. Establish either a symmetrical compression member layout or an asymmetrical layout. For the asymmetrical configuration, as a general rule when using typical platform framing, a maximum of six additional studs (or 9") may be used at the interior studs as compared to the interior stud pack above. In summary, whenever you're designing an anchor tiedown system, it's important to understand the multiple design considerations. 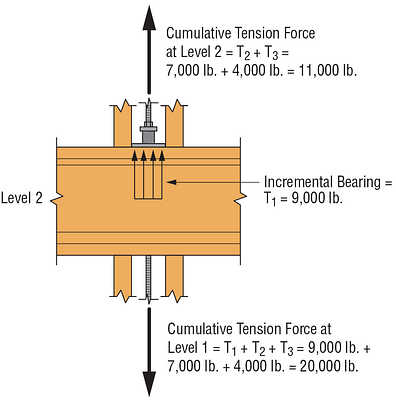 Know the difference between cumulative tension and incremental bearing. Estimate the vertical wood shrinkage and coordinate that with the rated travel distance of the specified take-up device. Ensure that rod elongation is being determined using net tensile area of the rod. Know the proper design checks for the steel bearing plate (bearing and bending). Understand the different take-up device options. Ensure that the system deflection is being evaluated per ICC-ES AC316 and do not permit skipping of floors.